The Vancouver Canucks have completed their draft picks for the 2011 NHL Draft in Minnesota. The Canucks haven't taken a WHL boy since Morgan Clark in 2008, but they did take a wide range of players this time around. 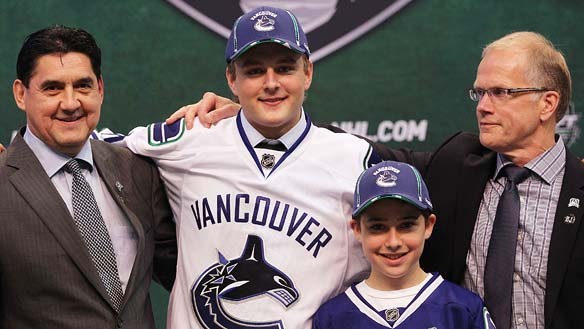 Of their 8 picks in 2011, the Canucks took Three Swedes, two Canadians, one Czech, one Dane and one American. They picked five forwards, two defence, and one goaltender. Jensen hails from Denmark, and will join fellow Dane Jannik Hansen on a Canucks squad that enjoys its Europeans lately. Some suggest that Jensen could be the next European power forward, as his speed and skating ability compliments a solid, accurate shot. Some compare him to a previous Vancouver draft pick - Michael Grabner, with a bit more size. Of course, it has yet to be seen if Jensen will be as prolific a scorer as Grabner was this year for the New York Islanders. Courtesy of HockeysFuture.com: A big goaltender, Honzik moves very well in the crease. Playing a butterfly style, he sometimes drops down too quick, but thanks to his large frame, he takes up a large part of the net even when on his knees. With such noticeable improvement over the course of the season, some think that Honzik is just scratching the surface of his potential. Grenier had a solid opening campaign for the Quebec Remparts, but really turned it up a notch in the playoffs with 8 goals and 16 points in 15 games. Most bigger forwards take an extra year or two to pan out, and are often attributed a 'long-term project' label. With good speed and hands, he could have all the tools to become a quality NHLer. Grenier shows promise so it will be interesting to see how he progresses this coming season in the QMJHL. Joseph Labate has committed to the University of Wisconsin for 2011, and shows a nice scoring touch for a big man, as evidenced in the video below. Labate scored 25 goals and 58 points in 25 games for the Holy Angels Academy in 2009-2010 before recording 27 goals and 49 points in 25 games with the Holy Angels in 2010-2011. HockeysFuture.com also states that In 1 playoff game, Labate scored 2 goals and added 1 assist for 3 points. Labate also played for Team Southeast in the Upper Midwest Elite League, scoring 2 goals and adding 6 assists for 8 points in 5 games. His time with that team was shortened due to a foot injury. In 3 playoff games, he scored 4 goals and added 2 assists for 6 points. Labate was a finalist for the 2011 Minnesota Mr. Hockey Award. Touted by EliteProspects.com as having the potential to become an excellent role player. Has great size and wheels and works really hard. Gets involved in the rough stuff. Somewhat limited offensive upside. Does not have much scoring touch, but appears to be another Jannik Hansen type, a good checker and penalty killer. Frankie Corrado demonstrated offensive potential last year with 30 points in 67 games in the OHL. Corrado can definitely skate well as evidenced by this beautiful end to end goal shown below. He also scored a similar beauty against Mississauga in the OHL Playoffs. Corrado picked up 94 penalty minutes last year as well, indicating that he can do more than wheel and score the occasional goal. Following in the tradition of the Vancouver Canucks drafting Swedish twins Daniel and Henrik Sedin, the Canucks selected Pathrik Westerholm of Sweden. A skilled offensive player. Has great chemistry with his twin-brother Ponthus. Good hockey sense and is the more noticeable goal scorer of the two. Passing and shooting game is good and so is his puck handling. Cycles the puck often with his brother. The question has been raised if he can be a productive player without his twin, but Canucks fans have heard that before, and probably did not give that concern too much though. His twin brother Ponthus Westerholm went undrafted, unsure if the Canucks will try to get him under contract or not at this point. Courtesy of EliteProspects.com. A mobile, offensively skilled defenseman, Tömmernes is a very good skater and playmaker from the back end. Has terrific hockey sense, so his defensive game is solid as well. Often gets his point shots through the traffic in front of the net. Henrik is 20 years old already, indicating that he may be a late bloomer, but also closer to being an NHL ready defender for the Canucks' franchise. Yeah, I think Bernier and Corrado look interesting, at least based on their descriptions and limited highlights. Will be interesting to see how they develop!